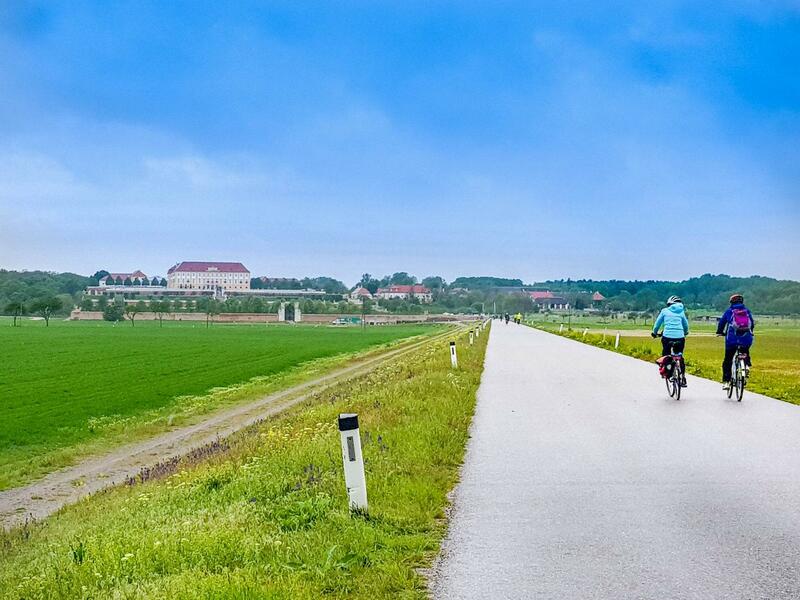 From the colourful Bavarian city of Passau, flat, easy going cycle paths lead you to the famous Schlögener Loop and through the enchanting Slovakian capital of Bratisalva. Journey through the Blue Danube where fairy-tale castles pepper the riverbanks and Western Europe meets Eastern in stunning city of Budapest. Indulge in the sweet treats of Vienna’s café culture and sail through the vineyards of the Wachau Valley to round off a delightful week of cycling and cruising the River Danube. 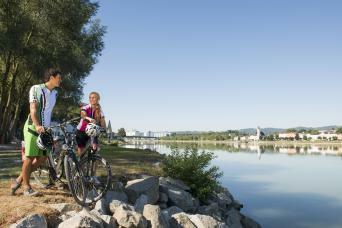 Due to popular demand the Danube Bike & Boat tours are selling out fast. If you are interested, please contact the team and secure a place fast to avoid disappointment. 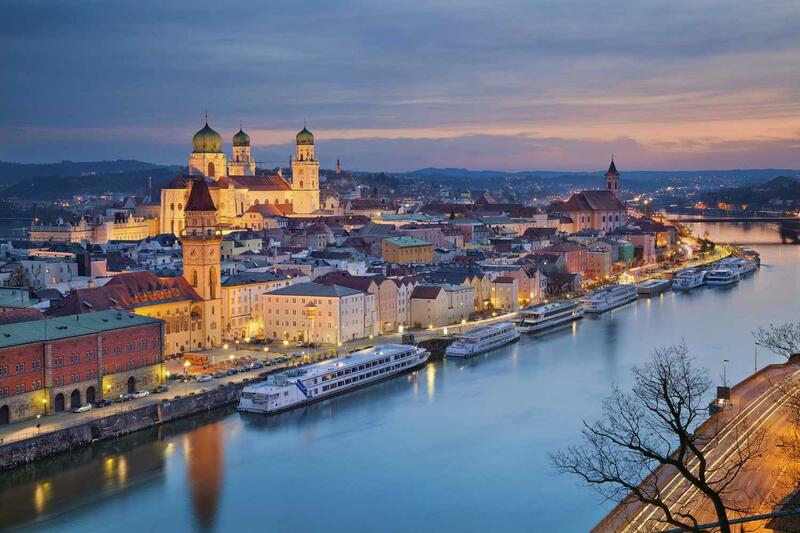 If you have time to spare before boarding, the historic Bavarian city of Passau is a delight to explore. The Old Town was created by Italian baroque masters in the 17th century and reveals soaring towers, picturesque palaces, promenades and romantic lanes. Boarding will be in the late afternoon and there will be plenty of opportunity to enjoy a drink with your fellow cyclists on arrival. The picturesque and historic Austrian market town of Engelhartszell is famous for its Trappist monastery. The traffic-free Danube cycle path heads downstream, to the impressive Schlögener Loop, where the river makes a dramatic about-turn of 180 degrees. Your boat meets you later in the day at the market town of Aschach. Guests will enjoy dinner before retiring to their cabins as the boat sails into the night from Austria to Slovakia and to the town of Devin. Today you’ll be cycling along the former ‘Iron Curtain’ to the Imperial Palace of Hof. 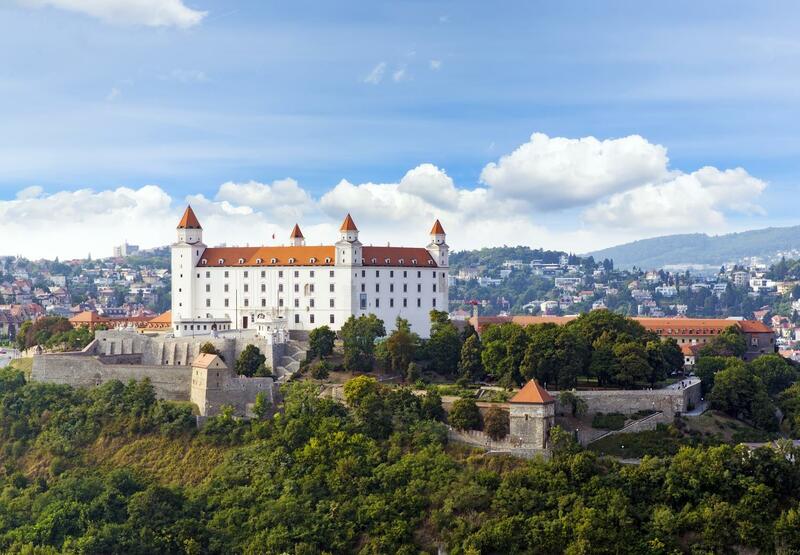 The next section of the ride takes cyclists to the Slovakian capital of Bratislava, which is stunningly located at the foot of the Carpathian Mountains. In the evening, there is an optional rail tour and walkabout in Bratislava or alternatively you can relax in the comforts of your floating hotel. 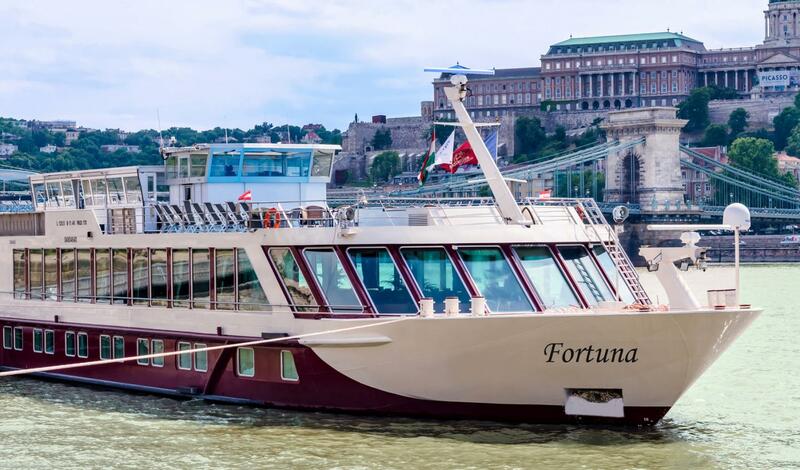 Take time to enjoy panoramic views from the sundeck of the boat over the Danube’s beautiful landscape and the gateway to Hungary’s capital city. Cited as one of the most beautiful cities in Europe, Budapest’s extensive World Heritage Site includes the banks of the Danube, the Buda Castle Quarter, Andrássy Avenue, Heroes' Square and the Millennium Underground Railway. Back on board, the evening entertainment is an optional traditional Hungarian folklore show with music and dance at Csarda. One of the highlights of your tour is the Hungarian Danube Bend, acclaimed as one of the most beautiful sections of the Danube. The river winds through the Visegrad mountains and then makes an abrupt turn south between Esztergom and Szentendre. 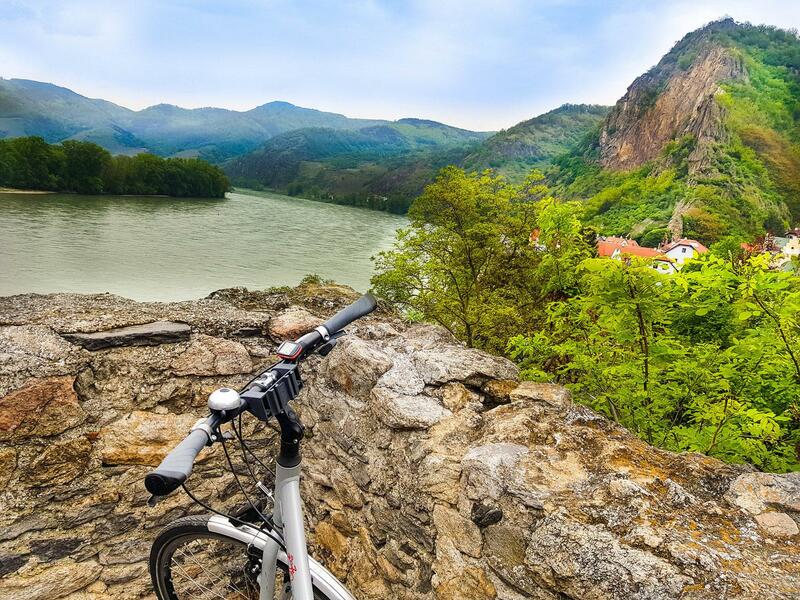 Your ride today starts at Visegrad, which is the site of an impressive fortress and the ruins of a former palace, where you have a choice of two cycle routes. Stroll through this wonderful city and take in the famous attractions, such as the fabulous Hofburg Palace, the State Opera House, the stunning architecture and interiors of the Cathedral of St. Stephen and the Votifkirche. A must-do is a visit to a Viennese coffee bar. Tonight there is an optional classical waltz and operetta concert in one of Vienna's famous palaces. 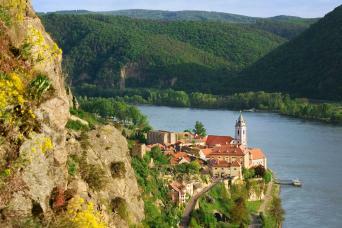 Today you’ll be enthralled by the famous Wachau Valley scenery. Vineyards and apricot orchards rub shoulders with castles, monasteries and numerous historical ruins. 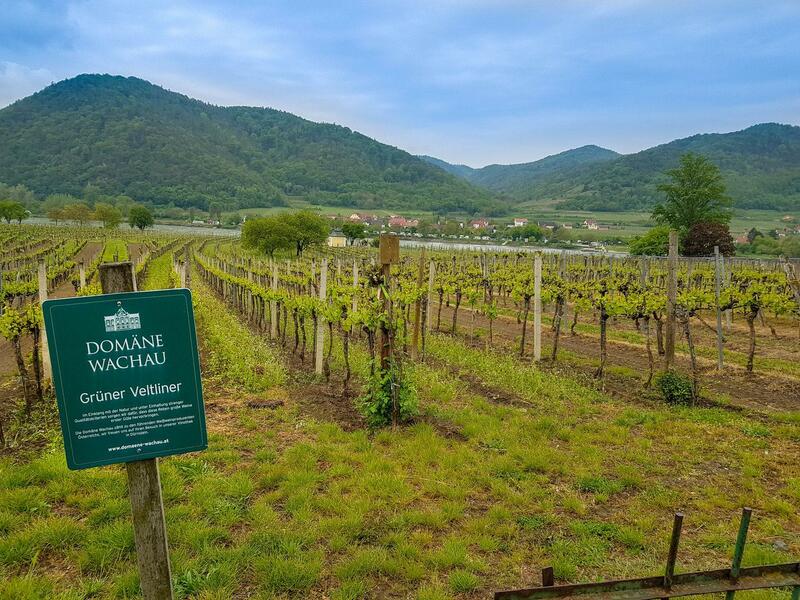 An optional extra is a visit to a traditional Wachau wine grower for a wine tasting before returning your cruiser for a final farewell dinner. 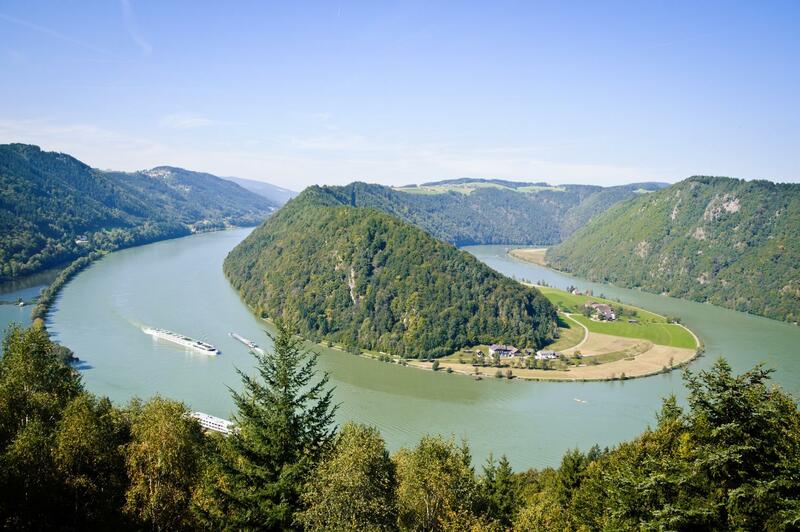 Soak up the atmosphere of the Danube valley as you sail along and recall the amazing sight of the Danube Loop before arriving relaxed at Passau. Disembark at approx. 10h30. Connecting travel should be booked no earlier than 11h30 onwards. We can book additional nights in Passau, either before or after the trip, just let us know! 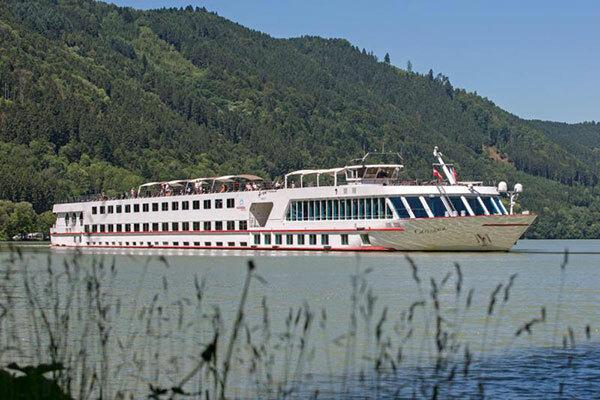 The 4* MV Carissima is the newest river cruiser to Danube Bike & Boat journeys. Upon boarding your welcome be the panoramic lounge and bar where you can enjoy a glass of local wine or German beer. After a day's cycling the sundeck provides ample space for relaxation and between the months of June and August the sundeck pool is available for a soothing dip. Alternatively you can always take time out in the sauna and whirlpool. Wifi is also available (payable locally). All cabins are en-suite and are equipped with air conditioning, TV, safe and hairdryer. 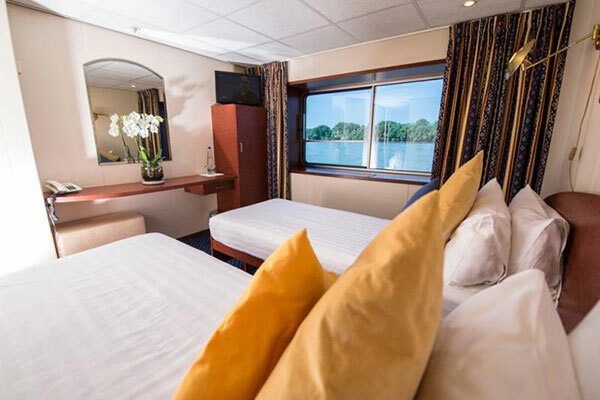 The Standard Eco Cabins are located on the main deck and comprise of split beds. 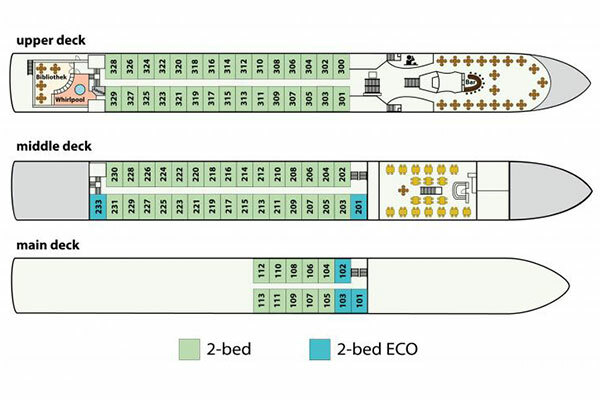 Middle deck Eco-Cabin upgrades are available. If you would like to upgrade to a 2 bed cabin (twin or double bed), these are available on the main, middle and upper decks. The upper and middle decks have full size picture windows (non-opening whereas the main deck cabins have half non-opening windows). Cabin prices are based on main deck eco-cabins. Upgrades to middle and upper deck cabins are available. Further information can be found on the 'book now' page. breakdown of engine or power unit. hotel but also a machine, working with engine power even at night. cause noise. If you are a light sleeper please bring ear plugs. This tour is available to start on Sundays from April to October: Prices vary depending on the season and the type of cabin preferred. Starting prices are for a main deck ECO cabin. Upgrades can be booked to further cabin types, by adding a supplement when booking. Although almost completely flat this cycle tour is graded easy to moderate as the daily distance ranges from 24 to 45km. 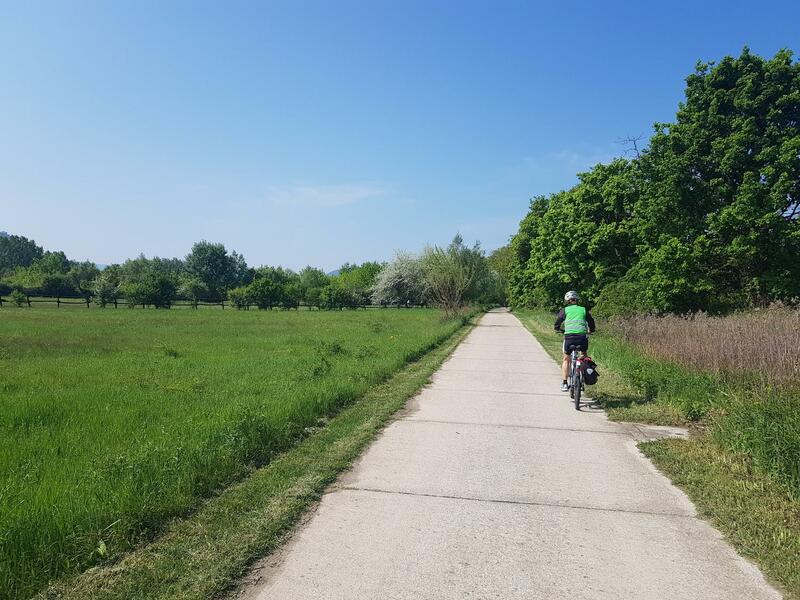 You will be cycling on the Danube Cycle Path which follows predominantly flat, traffic free cycle paths and some quiet roads. Please do be mindful of other cyclists and motorists at all times. This tour is particularly well suited to families and novice cyclists as the route is flat, and you have the option of staying on board if you don’t feel like cycling. The route is way marked throughout and we supply you with a detailed route map, guidebook and information pack so you will have no problem following the route. The on board tour guide will also give you a briefing each evening about the route and highlights of the next day’s cycle. We supply you with detailed maps, route notes and an information pack so that you can easily follow the route. You will also have access to the Macs Adventure Smartphone App enabling you to follow the route using your phone’s GPS so using this combined with the provided route notes and maps means you should have no problems finding your way. We also have a 7 day service hotline should you encounter any problems. 7/21-speed unisex hybrid bikes with coaster (back pedal)/caliper brakes are included in the cost of your trip. All rental bikes are equipped with a pannier (saddle bag) and a speedometer. Helmets are not included as part of the rental package and we ask that you bring your own helmet or buy one onboard (€25). If you would prefer we also have a limited number of electric bikes available on request at a supplement. Due to very limited space on board there is limited availability to bring your own bike – please check with us. Children’s bikes, seats, tagalongs and trailers are also all available on request. Linz (1h30), Salzburg(2h45), Munich (2.5h) and Vienna (3.5h). Please visit the DB Bahn Website for train times, fares and bookings to Passau. You may also wish to try Rail Europe for European rail tickets and passes. Tour guide on board (does not cycle with group). Information pack with route book (one per cabin). Access to the Macs Adventure Smartphone App. Single upper deck cabin supplement(s). This trip is graded as easy because the route is almost entirely flat. Daily distances are between 18 and 49km so you will need to have a basic level of fitness and we advise some training before the trip. If you would like to opt for a 'rest day' then you are always welcome to stay on board and relax. All cycle tours are unguided, however you will receive a map and route notes to ensure you find your way. Our pre-departure information pack has detailed advice and a kit list on what to take. You’ll need to wear a helmet and bringing your own is always more comfy. Helmets are not available for hire but can be purchased on board for around €25. If you have any questions about what to take then we’d be happy to share our own top tips and advice. When does the boat sail? The Danube is a busy and working river, there are lots of operational boats on the river. On this tour when possible the Boat may sail at night while you sleep or early morning, depending on clearance and the Captains schedule. This can change from day to day but they do try to keep this on schedule to the itinerary where they need to sail to the next destination to pick you up after your cycle. If you like you can stay on the boat during the day if you need a rest or do not feel like cycling one day. The best option is to fly into Munich or Linz, which connect by train to Passau. Best bike and boat tour? A cruise with enjoyable excercise. 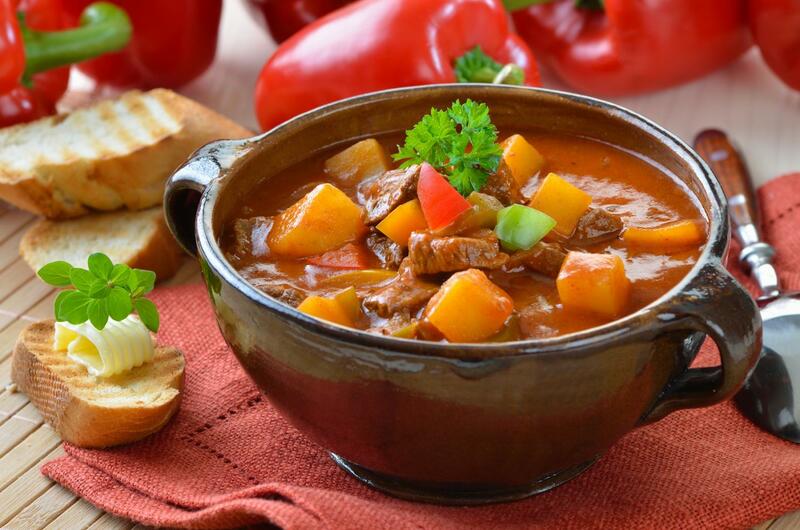 Food and relaxation on board with healthy excercise on the bike rides. Stunning scenery on both. 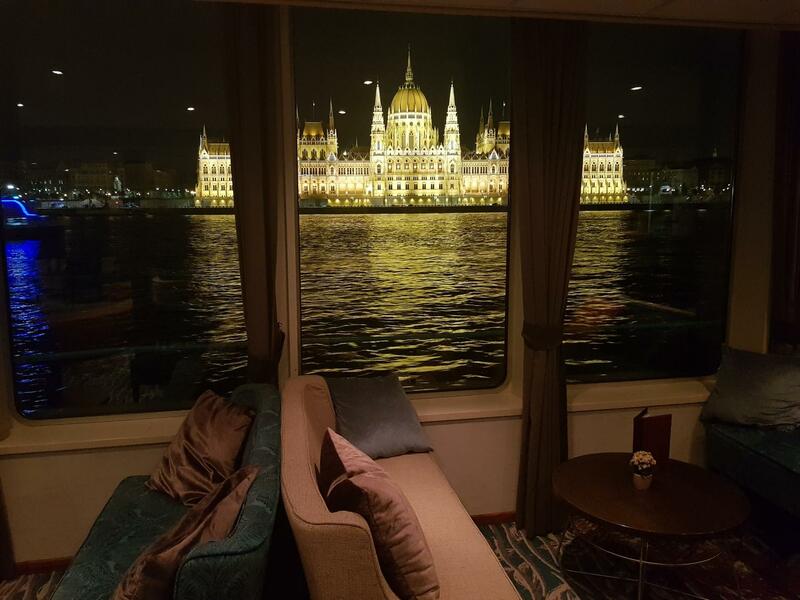 Had a great view if Parliament at night from our cabin window when we were moored across the Danube in Budapest. Only 4 major bike rides were included. Would suggest cutting out Budapest to give more time to explore the Danube. Times to be back on board Carissima were often too early, leaving little time to explore when the rides were finished. Wonderful boat and bike adventure. This welll organized bike and boat adventure was a highlight of our trip to Europe. They even provided sunny days for us. Simple summary: We all wanted another week! The crew and tour director were great, the people at our table made for great companions and by end we all rode together. The food was excellent and always served hot. The crew always tried to please......WHEN needed, meaning "seen but not heard, until you needed them. Excellent and seamless. As a traveller who loves seeing new places on holidays with a balance of activity and relaxation, this pressed every button! From the moment we stepped onto the boat we were surrounded by positive, like minded people of several nationalities - and this includes the staff. The company running the boat has one aim - to bend over backwards for the passengers. They worked like a family - managers pitching in with the more menial tasks such as unloading 100 bikes from the boat each day. Everybody wanted to be there and the staff seemed as happy as the passengers. The bikes were comfy and well maintained - adjusted to height before we got there with a name label on. The cabin was comfy with plenty of room, the food was incredible and the service impeccable. Their attention to detail was really noticeable - they even thought about seating for meals and made sure that each table had a common language. As the only brits aboard we felt in no way isolated - the staff made sure of that. The 25% English speaking contingent came from 7 countries and we were given separate briefings and English speaking waiters. Tips - Dress casually, I took too many clothes because I didn't know what to expect. Most spent the whole day in cycling gear or casual clothing. This is not a 'dress for dinner' cruise. Contrary to the information in the bumph, the boat does accept all credit cards. The cabins on the promenade deck are no different to the ones on the middle deck, even though they are more expensive. They are identical. Don't worry about the long cycling distances. It's not completely flat but it's easy cycling. I'm a 61 year old occasional cyclist and I coped ok. You have loads of time. On two occasions we beat the boat! Be prepared for changeable weather. Stay in Passau at both ends of the trip - it relieves pressure and it's a beautiful place. Well worth a visit in its own right. Use public transport from Munich airport - it's a piece of cake and very cheap. Last tip - do it! Fantastic way to visit the Danube! Loved the luxury of a cruise but also loved the exercise of cycling amongst the beautiful countryside. The time of year provided us with perfect weather and the staff were amazing! Also got to visit great cities like Bratislava, Budapest and Vienna! This was an excellent trip that included daily bike rides as you cruised the Danube. A fun and spirited crew that did their best to keep us happy and well fed. Looking forward to our next adventure. 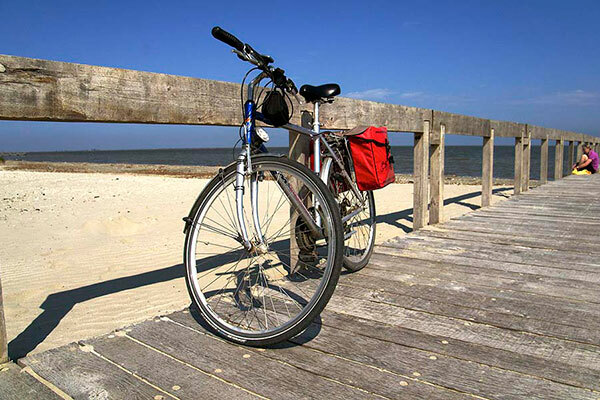 Ideally suited to beginners, occasional cyclists and families this bike & boat tour is on a flat cycle paths with the options for shorter bike routes each day. Visit no less than four countries and three capital cities as you travel past vineyards, orchards, castles and rolling hills, with each night spent on a stylish 4* river cruiser.